Urban planners should abandon their obsession with fighting congestion in favor of building more housing in traffic-choked cities because people who live in congested urban centers actually have better access to good jobs and economic opportunity, a new study reveals. It’s no great surprise that the best jobs in the study region — the San Francisco Bay Area — are in congested areas, but, according to the study by a team of UCLA researchers, commuters who lived near uncongested highways on the fringes of the region couldn’t get to the best jobs faster than people living within the high-traffic areas. “The most densely developed places typically offer the highest levels of access, despite typically higher levels of congestion,” the researchers wrote in the study, which was published in May in the journal Transportation Research Part A. The study analyzed the number of jobs available to the 8.2 million people living in the nine counties making up the San Francisco Bay Area. The authors calculated the number of jobs available to commuters living in 1,454 “zones” across the region, cross-referencing data on travel time, distance, speed and job locations. Those living in the most central zones had greater proximity to jobs, including higher-paying IT jobs, despite the congestion. The higher rate of speed enjoyed by exurban residents couldn’t make up the difference, the study found. In fact, proximity was almost three times greater a predictor of job access than speed. For IT jobs — which the study assumed people were willing to travel farther for because of the greater pay — the effect was much more pronounced: 18 times greater for proximity than speed. 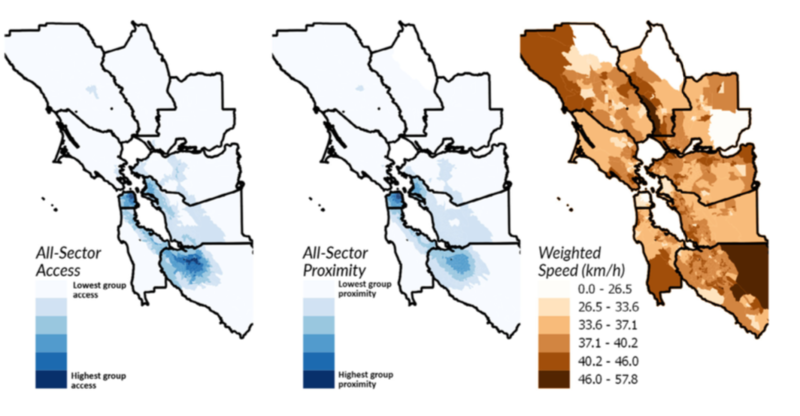 Even if congestion could be dramatically improved across the Bay Area, the authors found, the effects on job access would be relatively minor. As frustrating as congestion is to drivers, only 5 to 12 percent of the region’s residents would see an “appreciable” increase in job access if congestion was essentially eliminated, the job access models the team created showed. That, practically speaking, would be impossible or cost prohibitive to accomplish anyway. The findings shouldn’t be surprising to anyone with even a passing knowledge of real estate prices in the Bay Area. But the proximity effect — the more important factor from a worker’s perspective — has been almost entirely ignored by the highway planning profession, which has spent billions trying to relieve congestion on urban highways, and largely ignoring the role that land use plays in people’s travel behavior. Workers in metro regions would clearly be better served by more affordable housing options near jobs, the authors said, recommending infill housing in the urban core. Jim, you have been to Europe. To make such a statement considering this is amazingly obtuse. Families move out of cities because high density areas in the U.S. so dramatically subsidize low density that there is an economic advantage to do so. One of the major ways this money transfer happens is highway building. In Europe, there is a common refrain: ‘I would love to live out in the country but I have kids’. It’s got nothing to do with back yards for children. Remember if you earn $2,408 a month you don’t see that much after taxes. Housing should be 25% of your after-tax income. The way I was taught 25% of your after tax income goes for housing, 25% for retirement, 25% for savings, and 25% for everything else (food, carfare, clothes, entertainment, etc.). For someone making $14/hour, their monthly take-home is maybe $2,000 a month (less if they live in a place with city or state taxes). 25% of that is $500 a month. This sharply contrasts with the so-called affordable housing developers put in buildings to get tax breaks. In NYC a lot of this “affordable” housing starts at $1,500 a month. For $1,500 a month to be 30% of your after-tax income in NYC you would need to earn about $7,500 a month before taxes, which is $90K annually. The kicker however is they’ll limit these apartments to those making maybe $35K or less. That basically means they expect people to pay something like 70% of their after-tax income just for the roof over their head. That’s insane. When those affordable stretches fill with young families and professionals, they’re no longer affordable to those who are living there. Where are these people supposed to go? Freedom also means freedom from subsidizing one type of housing over another. Back at the turn of the century only farmers and the wealthy lived in the country. Low density living inherently costs more per capita. The only reason the equation is skewed now if the trillions of dollars spent subsidizing automobile travel since the 1950s. Had we not done that, most people would be living in either cities or streetcar suburbs. The latter is a wonderful alternative to city life if people need more space for families. Of course, streetcar suburb means houses on reasonable 1/10 acre lots. You still have a yard, but it’s not the size of a park. The huge parcels of land woulds be something only the wealthy could afford if we didn’t subsidize the automobile. Same thing in my area. I moved here 40 years ago. Back when we first moved here I could ride my bike most times of the day without hitting much traffic. The exceptions were the morning and evening rush hours. Now I’m pretty much restricted to after 9PM and before 6AM if I want to have an enjoyable ride without people constantly getting in my way or double parking. To add insult to injury, the increased traffic levels resulted in a huge increase in the number of traffic signals by I’d say a factor of 3 to 5. Again, this makes riding unpleasant as it means that many more times I need to at least slow down to check if the intersection is clear. Until we get subways and greatly improved bus service here we shouldn’t increase density any more. It’s not NIMBYism to expect the same services other parts of the city with similar density have. Perhaps true but keep in mind higher prices only benefit the owner if they plan to move to a cheaper area. If they plan to stay, it doesn’t benefit them one bit. If they plan to move close by, they’ll sell high and buy high, so again no benefit. Real estate speculators and flippers are the ones who benefit most by a restricted housing supply. To that end I think cities should have a tax rate of about 90% on profits from home sales if the home is held less than 5 years. These commutes would be less punishing if American suburbs weren’t so illogically built. You’ll see a housing development, a few miles of nothing, another housing development, a few more miles of nothing, and so forth. And you’ll find residential, commercial, and schools separated by a lot of empty space. Why not put all this together? For example, when I look at how Long Island is settled, particular the eastern half, you can have the same houses with same amount of property west of the Nassau County line if everything had been consolidated. There would be virtually nothing on the eastern half of long Island. The maximum distance anyone would be from NYC limits might be 30 miles. The higher average density would make rail travel very viable, especially into the city. But that isn’t how home owners (including some in my own building) think. And many do plan to move some place cheaper later in life, so those people do benefit. We belong to a private B&B travel club and have stayed many times with club members in the suburbs or the far reaches of a metro area. The highways to get to the cities are excellent and the main arterials in the suburbs work quite well – with peak rush hour congestion just as we have. One big difference is the better transit systems in the cities. Another is the usual European tendency to live in smaller houses/condos/apartments/yards. Yet another behavior difference is caused by the $6-$7 per US gallon fuel costs, a discouragement to long commutes. Exactly. Those are the gas prices when you price it to support the roads that gas is burned on. That’s my point. You continually throw up your hands and make claims that the situation in the U.S. is ‘free market’ and ‘individual liberty’ and ‘quality of life choices’ while knowing completely that the discrepancy is created by the government subsidy of the the private car in the U.S.. It’s disingenuous and doesn’t advance the conversation. Chicago has massive areas of land that you can’t give away. Same with most other cities. These changes do not happen over night and the government already owns and funds much of the housing in these ‘undesirable’ areas presently anyway. Garfield Park doesn’t become Lincoln Park in a generation and Garfield park has a long way to go before all the abandoned lots and houses are even occupied. This is an issue, sure. However for many of the severely depressed areas in the U.S. I personally feel that there are existing programs to address this. Crime and empty lots or neighbors, jobs, supermarkets and you need a roommate….. I’m going with the former. European fuel taxes and registration fees go WAY beyond what is needed for their roads – with much of the revenue spent on other totally unrelated things. The US federal fuel tax has not been changed for 20+ years, due to the lack of gonadal material of federal (and many state) legislators. The NMA has advocated for proper user fees for the roads for a long time, and fuel taxes which cost only about 1% of revenue to collect, plus are directly proportional to use, plus encourage the use of fuel efficient vehicles are the right way to collect the fees. Claiming “subsidies” for the private car doesn’t advance the conversation either. I totally agree. Claiming those subsidies for the private car is exactly what has made the transportation system in America so terrible. It is good to hear your organization is against it. However, your claim that the fuel taxes in Europe go beyond what is needed to fund the private car and material movement and all it’s externalities is a fallacy. You are misinformed. I am not willing to take the time to prove it, but NOT all the fuel tax and registration revenues in Europe go to the roads and related expenses. Fuel tax and registration revenues pretty well kept up with road costs in the US until about 25 or 30 years ago – especially when portions were not robbed to support transit systems the fuel tax users did not patronize. We would happily support higher fuel taxes IF the increased amounts were required to be spent on roads and not stolen for other purposes. Reducing barriers to the construction of new housing would go a long way in helping. Well, you could use government power to force private land owners to sell their land cheaply to high end housing developers, or you could continue the current system of letting them work it out freely. In which, if one large farm refuses to sell out as cheaply as the developers are offering, then you end up with the pattern you describe. The less forceful way would be to tax the “empty” land the same as if it were all luxury homes, but I think most people agree that there is value in not having every last inch of land developed into suburbs. Actually, a better system would be that you don’t rezone land from farming to housing until all land closer to the central city is already filled with housing. This way farms wouldn’t be able to see their land to developers if there is empty space between them and existing developments. Also, when you rezone the land you shouldn’t specify residential, commercial, industrial, or educational zones. Just allow mixed use development. Let the free market dictate what gets built. That also means no restrictive zoning like only 1 or 2 family homes. The idea is as cities grow outwards they might initially build only private homes. Later on however you might see townhouses, then small apartment buildings, etc. The current pattern we have exists not just because some farms sell to developers while others don’t. Government indirectly subsidizes such development by building roads and utilities for these far flung housing tracts. If the developer had to pay for these things, the homes would be more expensive than most people would be willing or able to pay. Hence it wouldn’t pay to develop that land. It should be. If all the people in the US lived at the density of NYC you could fit them in an area smaller than the state of New Jersey. That would leave the rest of the country in its natural state. This all seems a logical outcome as one lines up at the tail of the que into town at an average commuting speed over distance that is increasingly close to walking or cycling speed. Planners need to convince those with the resources to spend on and control residential development and roading, the purchasers of residential options, and those planning and building our communities to make the related amenities safe, attractive, accessible and useful to a wider range of the populous. I rather expect we are on the threshold of that happening as a result of increasing fuel and food costs, all the result of increased commuting distance and time. The further out the poorer one will eventually be. Expansion of our housing stock increasingly into the outer suburban reaches of our market gardens is just reinforcing the cost trap those of use forced to live in the suburbs have and will increasingly experience. All the applicable economic philosophies and models planners have been brought up with direct our thinking in a centrist direction. Re-calculation of these even now just reinforces their wisdom. We are just having trouble implementing it within a Laissez-faire political economic model based on loading the cost of decisions made by local and central government onto the individual, thus removing the cost but not the responsibility from its source, the public purse holders, until, as we are beginning to see, the wheels eventually stop rotating, By then however we have made our communities and the individuals within them poorer as a result of these decisions. Is this some what like ‘reckless trading’ in the business sense? Most cities require the developers to upgrade nearby roads as a condition of rezoning. All utilities are done at the expense of the utility companies, often times the cost is passed onto the developer and it’s then figured into the cost of the building lot. How well does your city's transit system connect people to jobs? A new report from the University of Minnesota lays out how many jobs are accessible via transit in major American cities.